Watershed Bourbon is the first Ohio bourbon that I have reviewed. The operation is part of a small handful of Ohio distilleries that have revived the practice of distilling and aging bourbon. At the beginning of the 20th Century there were dozens of operations across the region, but regulations following Prohibition has made the state of Ohio one of the hardest states to start a distillery. Despite the challenges, owner and distiller Greg Lehman has stepped up to the plate to help revive Ohio’s bourbon making tradition. Watershed Distillery first came onto my radar while checking out David Reimer’s book, Craft and Micro Distilleries in the U.S. and Canada. 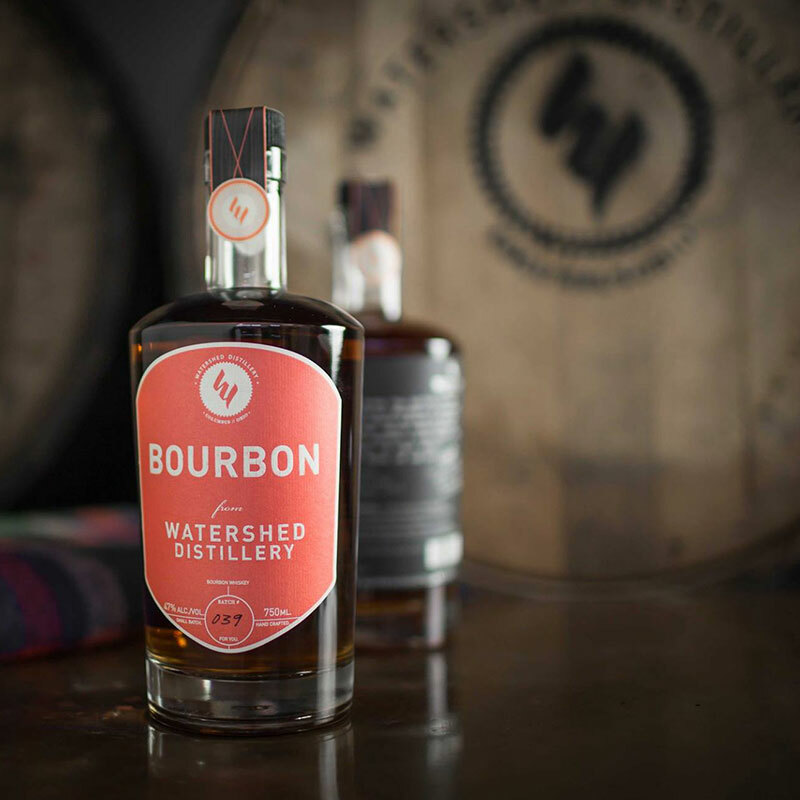 Watershed had been producing vodka and gin since their launch in 2010, but when I heard about their upcoming bourbon release back in 2013, I put it on my hit list. Watershed Bourbon is aged for 2.5 years, making it a particularly young bourbon. It’s age doesn’t show in it’s brown-orange color, but it definitely shows in the shyness of the nose. It took a few whiffs and a little time to let the bourbon open up to assess the aroma. Usually not a good sign, as I like bourbons with a lot of character from nose to finish. Regardless, the nose is a nice citrus, caramel candy, and black pepper. None of the nose-burning ethyl that some bourbons give off. New bourbon drinkers will appreciate the subtle introduction, but experienced bourbonites might be left groping. Watershed bourbon uses a four grain mash bill of corn, rye, wheat, and spelt (an ancient form of wheat with a slightly sweet and nutty flavor). This makes for an interesting play of flavors and textures, as you will experience the rye tingle, the wheat smoothness, and the taste of sweet corn. You can also taste the copper from the still in the middle of the taste. The finish leaves you with vanilla and orange, but is light and short lived. My primary qualm with Watershed Bourbon is it’s lack of character. We had a bottle from the first batch and Batch No. 22 with no discernible difference. However, Watershed has announced that after 2015, their barrels will be aged longer than 4 years. I think that will give their bourbon time to develop more of the character that their bourbon already has. If you are involved in the operation, reach out to us and keep us posted. We will be happy to revise this review then! Until their new aged barrels are released, I give Watershed Bourbon a grade of C.
Not a bad bourbon, but nothing to write home about. A 750mL bottle will run you about $40, making it affordable enough to try without too much guilt. Watershed might make for a mean Old-Fashioned, but drinking it neat might leave you wanting. I concur with your review. I’ve tried Watershed a couple times and found it to be good, but best when used in a mixed drink (a Manhattan as you mentioned). Since I live 5 miles from their distillery, I support them with an occasional purchase and look forward to juice with a bit more age on it.